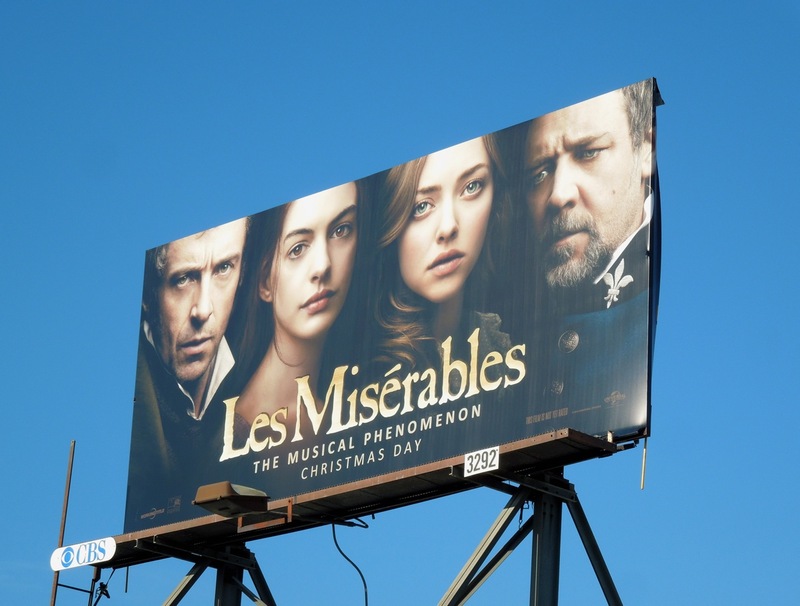 Happy Turkey Day one and all. 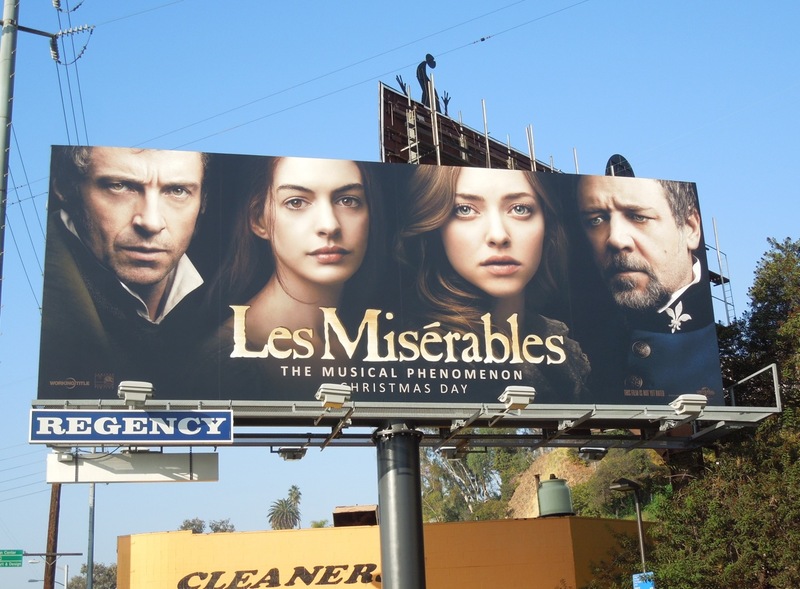 As it's Thanksgiving it's only appropriate that we showcase a blockbuster movie today, even if it doesn't open until Christmas Day. 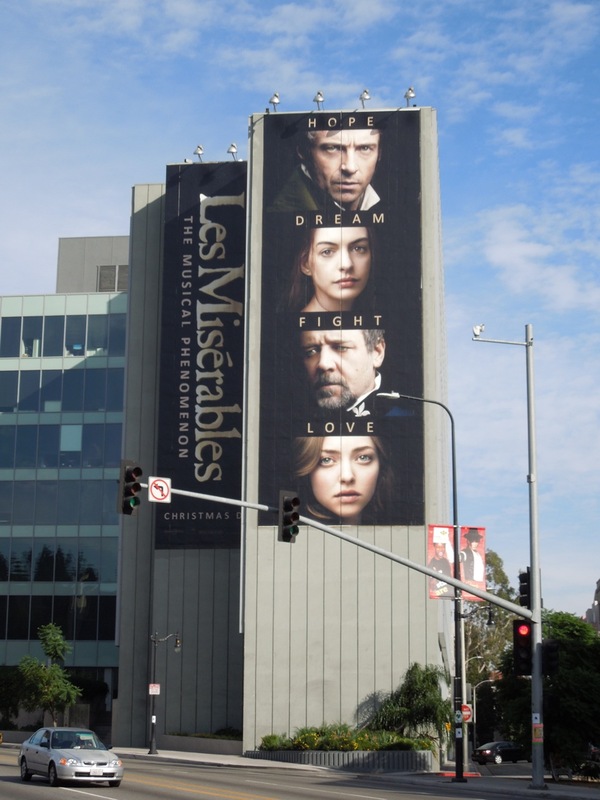 The infamous stage musical Les Misérables finally makes it to the big screen and it's sporting some serious talent to make this movie a success. 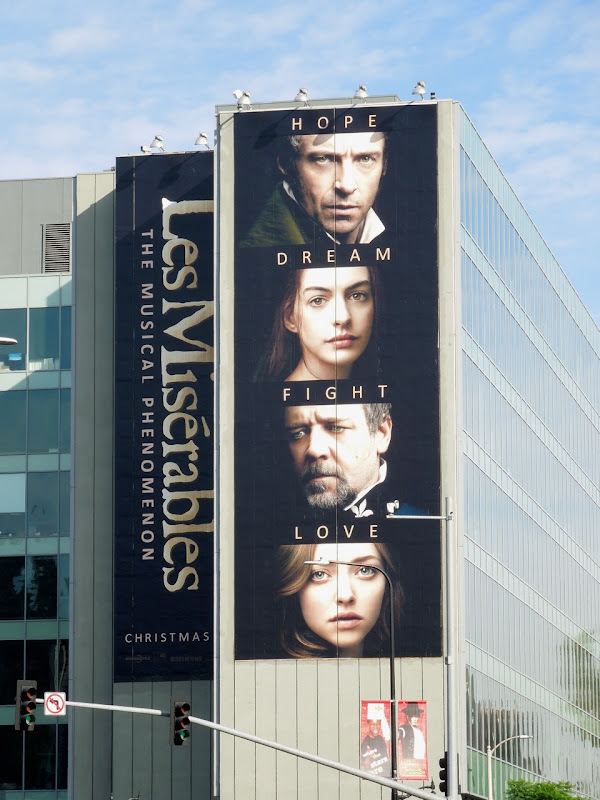 Hugh Jackman, Anne Hathaway, Russell Crowe and Amanda Seyfried lead this all-star cast bringing the stage musical of Victor Hugo's classic novel set in 19th century France to cinemas this holiday season. 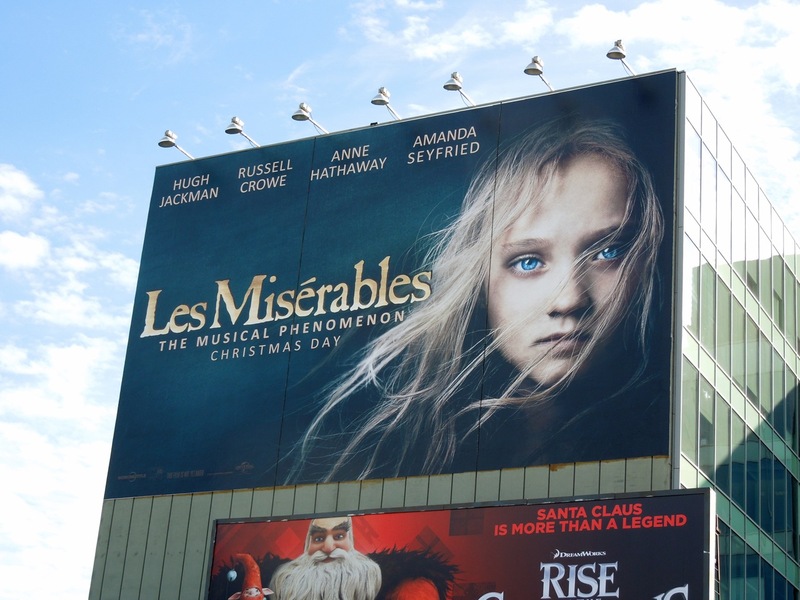 Daily Billboard especially likes how this cinematic version has reinterpreted the iconic 'Young Cosette' poster imagery this musical is famously associated with by using actress Isabelle Allen's windswept face. 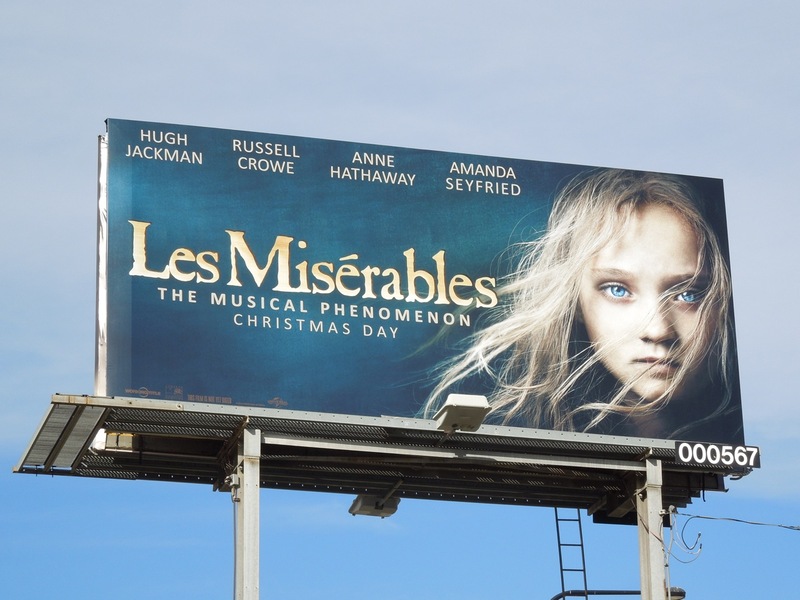 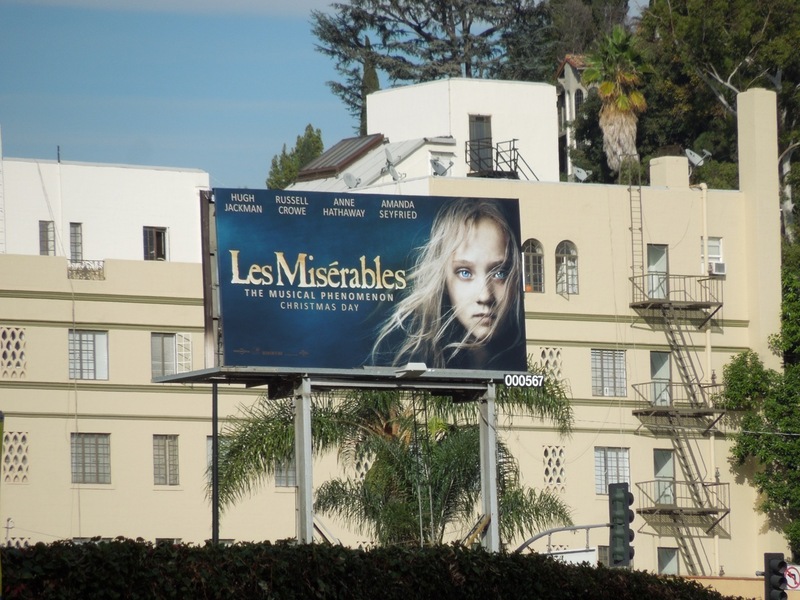 The giant-sized billboards were snapped along Highland Avenue at Franklin Avenue on November 14, along with the smaller 'Young Cosette' billboard. 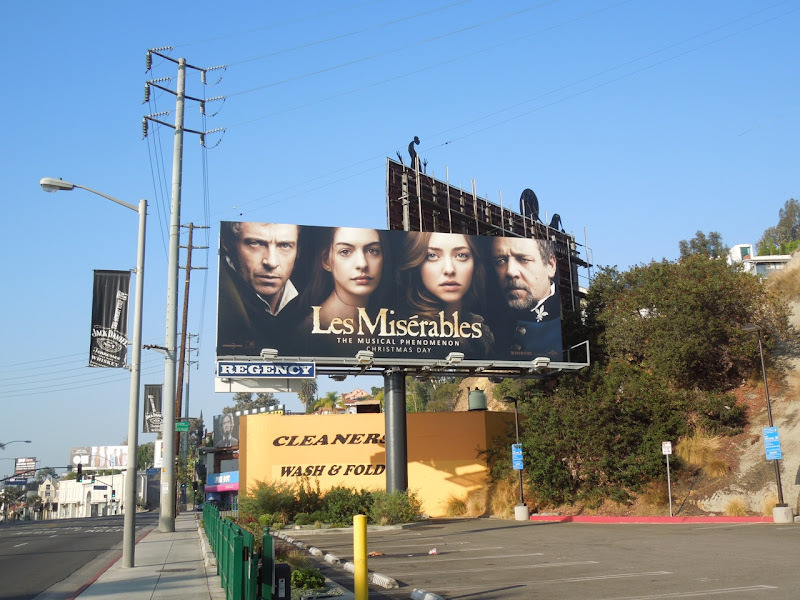 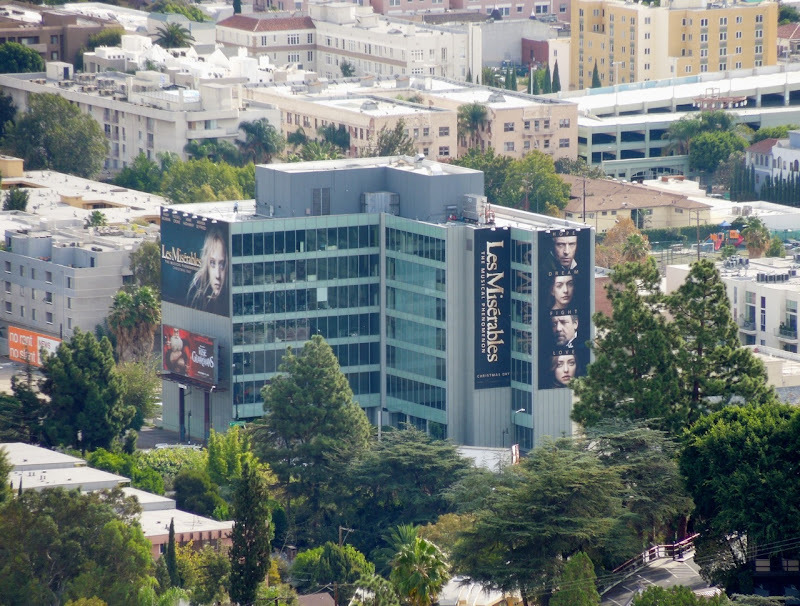 The standard landscape billboard featuring the main cast was snapped along Sunset Boulevard, whilst the smaller cast billboard was spotted along Melrose Avenue on November 21, 2012. 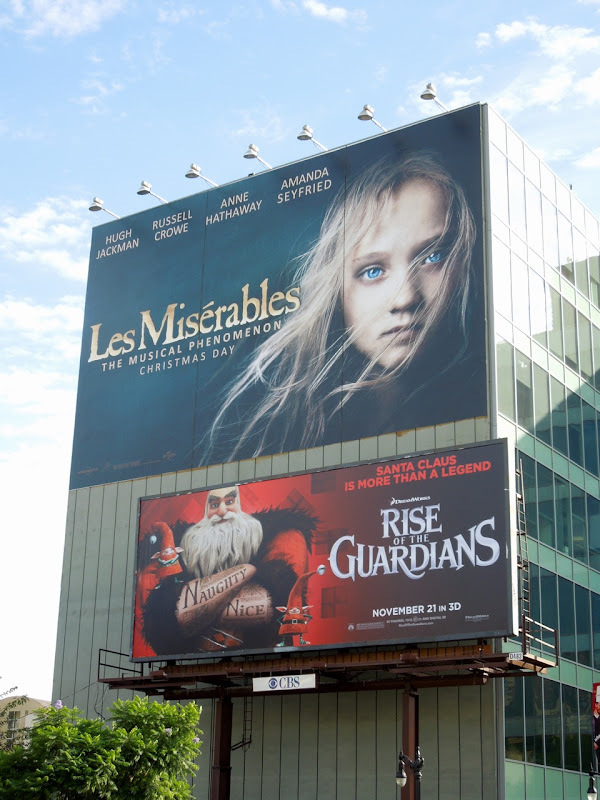 If you're a fan of musicals, you may also like to check out these Rock of Ages billboards and The Book or Mormon billboards. 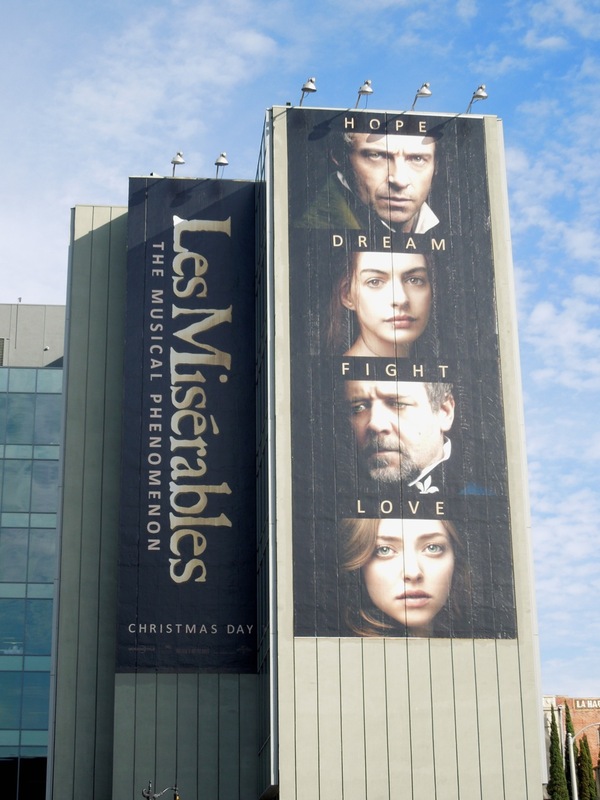 Broadway musicals have always had a tempestuous time when translated by Hollywood studios, so let's hope Les Misérables doesn't turn to be a big turkey at the box office this Christmas. 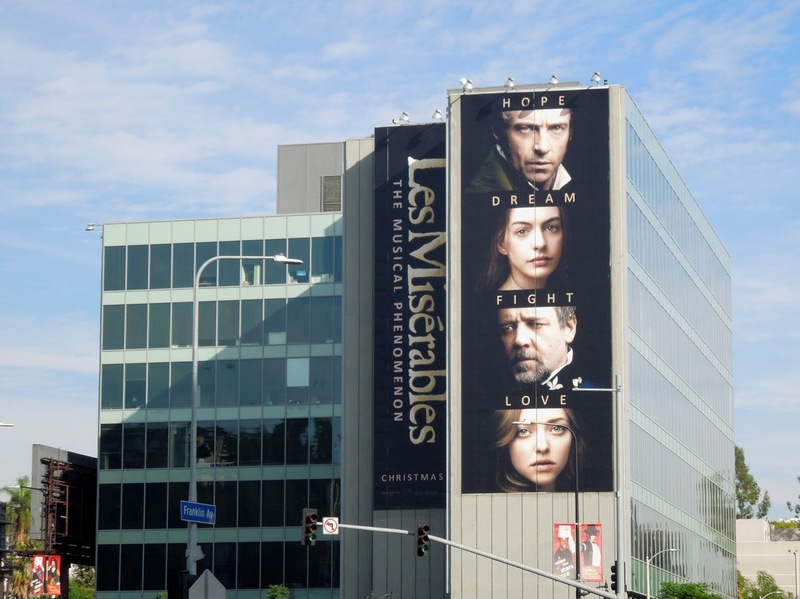 UPDATED: If you loved the movie, be sure to check out these original costumes from Les Misérables on display.